New to the Lion Music roster and a new name for us, Opposing Motion represent everything we’ve come to expect from Lion now .e.g progressive metal that’s well played and written. “Laws Of Motion” ticks all the boxes and isn’t a million miles away in approach from label mates Seventh Wonder yet the band have enough of their own hallmarks to keep them sounding original. Melody is high on the Opposing Motion list of traits with a strong leaning towards memorable melodic vocal motifs from Ludovic Desa, yet these tend to remain at the more aggressive end of the spectrum. The Deplanche brothers (David and Kevin) form a rock solid rhythm backdrop for guitarist Joe McGurk to lay down strong riffs and lead work over. This is definitely intelligent metal and you get the impression is all comes sickeningly easily for the band such is the confidence displayed in the material. After several spins “Forever’s Edge” is the pick of the bunch song wise, yet the closing epic title track runs a close second. Areas of improvement? The production is quite wet with a lot of reverb, something which does take away a little power and see some intricacies get lost in the mix but otherwise its all strong stuff and another good find by Lion Music. 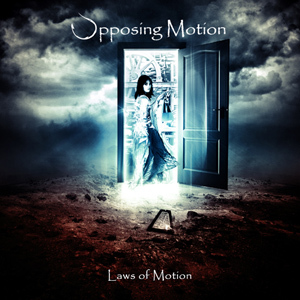 This entry was posted in Reviews and tagged Laws Of Motion, Opposing Motion, Progressive metal, review. Bookmark the permalink.